Walmart Marketplace is an invitation-only, professional seller community that gives you the opportunity to reach over 110 million unique visitors per month. This marketplace boasts its already existing infrastructure consisting of fulfillment centers, store distribution centers, 4,500+ stores, as well as the company’s world-class transportation fleet to ship online orders. Why Is Optimizing Walmart Descriptions Important? As of January 2017, Walmart had a total of almost 17 million products on sale. Even though Walmart only has 4.7% of the products Amazon has to offer, Walmart has quickly grown to be the second-largest online retailer. This makes it very important to optimize Walmart product descriptions in order to get in front of your customers first using this platform. With more than 600k SKUs being added per month, these graphs will continue to grow rapidly as Walmart is trying hard to compete with Amazon in the online retail space. 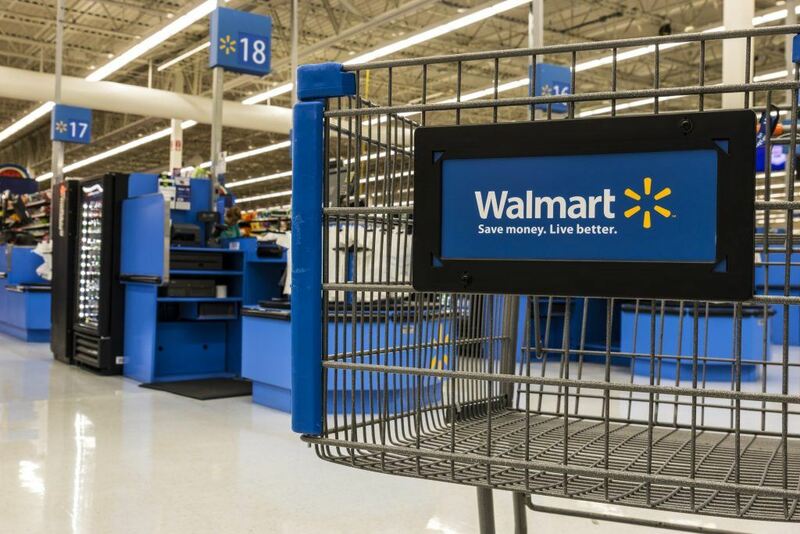 Unlike Amazon, there is a steeper barrier of entry to sell on Walmart Marketplace. Those that get accepted and onboarded to sell with Walmart Marketplace have a greater chance of standing out. As time goes on, Walmart Marketplace will surely make the Buy Box more sophisticated, but for now, the Buy Box is much easier to win vs Amazon’s saturated seller competition, as Walmart shoppers want to get the absolute lowest price anywhere. However, just because you may have the lowest price, it doesn’t mean your product will be found unless you have properly optimized your product description. In any online marketplace, the products that come up first during a search have the highest likelihood of selling. The only way to rank higher on Walmart Marketplace than your competitors is via your Walmart Marketplace product descriptions. Knowing how to optimize your Walmart Marketplace product descriptions can be a bit tricky, but we’ve put together this comprehensive guide to help you get a leg up on your competitors. 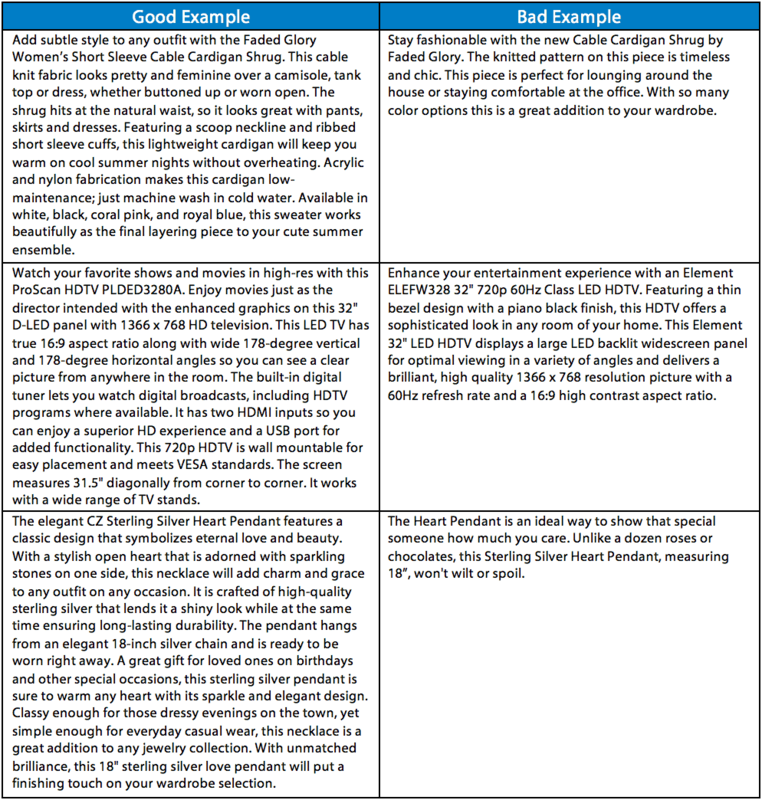 Walmart product descriptions contain four sections in which you can optimize your text. Since each section has a character count range, it is important to know what Walmart is looking for so that you can better optimize each section. This section is quite a bit smaller than Amazon’s title section in that it only allows for 50-75 characters. With the lower word count, Walmart is very specific about the order of information they want to be displayed in your product name. While this is pretty regimented, it’s important to note that Walmart does specifically instruct to make sure that you create a unique product name that isn’t word-for-word on other websites. 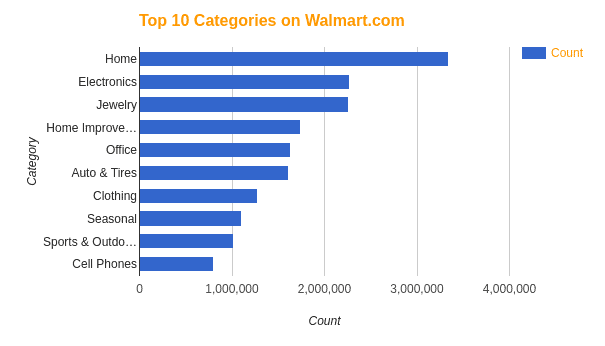 This backs up the fact that SEO optimization does matter when it comes to creating Walmart product names. Make sure the product name is at least 50 characters, but no more than 75 in order to be accepted. Create a unique and original product name that hasn’t been used before, if possible. Only put the color of your item in the product name if it’s likely customers will search for it. Do not include color in the Product Name if your product has a color variant group. Instead, include the available colors in the Shelf Description section. This section sits right below the shelf description on the product page. Calling it a “short” description is a little misleading as the requirements allow you to write between 500-1,000 characters in this space. Walmart specifically encourages you to use as many of these characters as you can – the longer the better! With this generous character amount, writing a well-crafted and keyword-rich description is essential in order to beat out the competition. Write a paragraph that is five to 10 sentences long. The paragraph should be at least 500 characters, but you can go up to 1,000 characters. The longer the better! Write copy that is clear and concise. No fluff or generic content in this section. Include the Product Name, Brand, keywords describing the item’s features and benefits and related words that customers are likely to search for. If you are selling a cardigan, use synonyms like “sweater” in the short description. Avoid repeating these words in an overly obvious way. This is the biggest section that Walmart has on their Marketplace pages. The requirements allow you to write between 1,000-4,000 characters, which is a pretty large range. With this much space, this is the section to really show off your expertise and knowledge with facts and tips, making you an authority readers can trust. Write at least 1,000 characters in length, or write a list of between 10 and 30 features and benefits. Make sure to include the Product Name, Brand, keywords describing the item’s features and benefits, as well as any other related words that customers will search for. Make sure your description is unique and original. Do not copy descriptions from other websites. Show expertise, knowledge, and authority with facts and tips. Be conversational in your writing. You are helping customers make an informed decision. Some slang is acceptable – as long as it doesn’t break an authentic, straightforward tone – since it captures more key terms. With two description sections available, these sections are your opportunity to show your “voice” and “tone” through your writing. These components of writing help to further your brand and give customers something to remember about you. This text should be easy-to-read and should be formatted in a way that is most helpful to customers. Unlike Amazon that has some very strict requirements about how you write your text, Walmart, on the other hand, leaves it up to you on how you want to present things to the customer. If you struggle with writing awesome copy that helps to brand your company and products, we can absolutely help you, as this is our specialty. Walmart doesn’t really have any specifics that would make keyword research any different than you would normally do it for SEO. If you aren’t sure how to do keyword research for your products, read this article we created about keyword research. There are several tools to help you research keywords, such as SEMrush (you can save 20% on this with BKA) or the Google Adwords Keyword Planner, to name a few. Another simple tactic is to conduct Walmart Marketplace searches for similar products in your space and see what keywords your competitors are using. Once you have a solid list of keywords for your products, you can then make sure that they are inserted into the editable sections that Walmart provides on your product page. As you can see from the example, the keyword “Disney Princess Carriage” is inserted more than once. Does this mean you should keyword stuff your descriptions putting the same keywords in the descriptions multiple times? 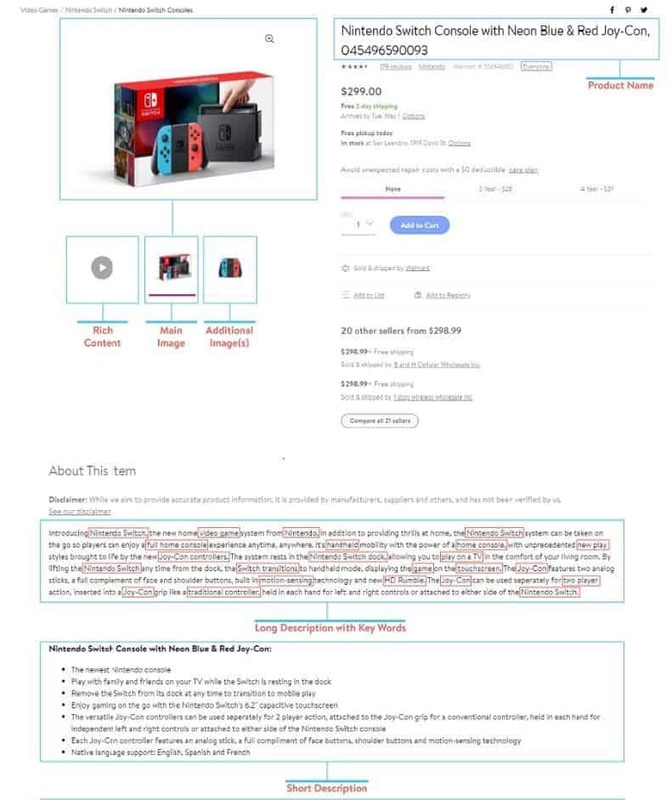 Remember that these description sections are meant to “speak” with your customer and provide them good information to help them make a decision to buy your product. This means that you should use keywords naturally as long as they make sense, and don’t overstuff. Most customers have used the internet enough to quickly be able to spot SPAM, which is exactly what keyword stuffing is. Do yourself and your company’s reputation a favor and don’t keyword stuff…ever. Now that we’ve gone through each section of Walmart Marketplace product descriptions, let’s recap how to optimize them. Use the formula – [Brand + Clothing Size Group (if applicable) + Defining Quality + Item Name + Style (if applicable) + Pack Count] and make it 50-75 characters in length. Use three bullet points and highlight the three most important benefits or features. Include keywords and do not repeat what the item is or include generic, meaningless information. Write a paragraph that is five to 10 sentences long. This paragraph should be at least 500 characters, with a max of 1,000 characters. The longer the better! At least 1,000 characters in length with a max of 4,000 characters. Show expertise, knowledge and authority with facts and tips about your product, as well as show off your brand. As you can see, ranking on Walmart Marketplace is different from ranking in Google as far as how to structure your content. Having Walmart Product Descriptions that utilize these optimization techniques is critical when it comes to helping your products rank and sell on Walmart marketplace. 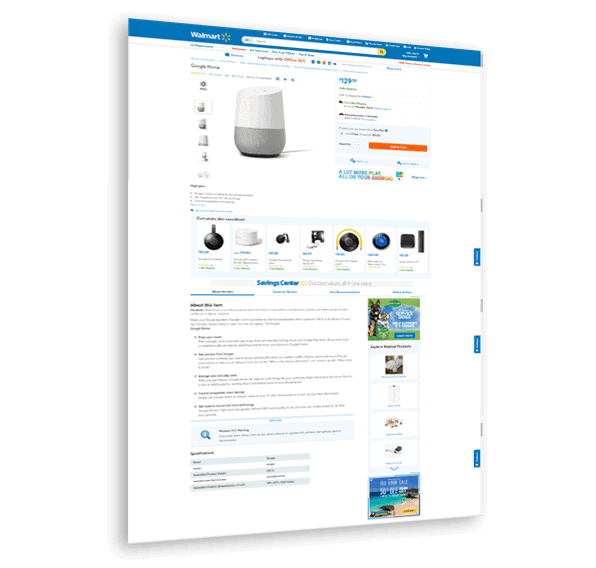 If you need help to optimize Walmart product descriptions, fill out the form and we’ll give you a quote. Need Help Writing Walmart Descriptions? Greg Secrist has worked in the SEO and content creation industry since 2009. He is the CEO and co-founder of BKA Content, an industry leading content creation services company. Greg is also a passionate tech geek, web designer, marketing pro and SEO expert. This blog post is awesome. Thanks so much! something which has personally brought big money into my pocket over the years. why I am unable to subscribe to it. Is there anybody getting similar RSS issues? about once a week. I subscribed to your RSS feed as well.